Use the information below to answer question 1 and 2. Ada and Udo are lawyers who went into partnership as Ado and Co. Ada brought cash of ₦12 000, furnishings worth ₦18,000 and a motor vehicle worth ₦70,000. Udo on the other hand brought in cash ₦10 000, his building valued at ₦105 000 and a personal computer worth ₦35 000. 1. What is the capital of Ado & Co.? 2. What is the profit-sharing ratio if it is based on capital contributed by Ada and Udo? 3. One major advantage of a ledger is that it __. 4. A trial balance is usually prepared by an accountant from account balances in the ledger for the purpose of __. 5. 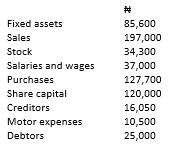 The total of the creditors at the beginning of the year was ₦4 600 and at the end of the year ₦5 250. 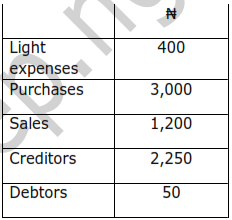 During the year, ₦26 500 was paid to suppliers and ₦130 was received in discounts from these suppliers. The purchases for the year would be __? What is the profit for the period? 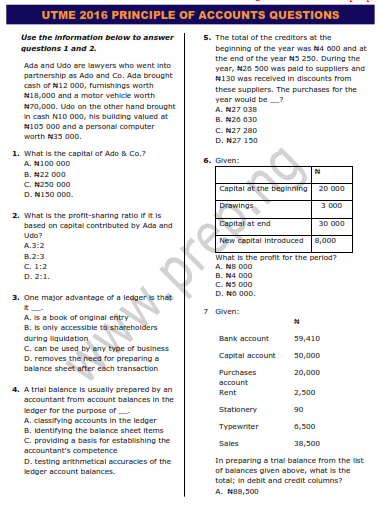 In preparing a trial balance from the list of balances given above, what is the total; in debit and credit columns? 8. The purchase of two generators by Hassan Electronics Enterprises should be recorded as ___. Determine the net profits of the partnership. 10. Dele and Seun who are in partnership. have decided to convert their business into a limited liability company where both become directors. To convert the __. A. they will simply continue since there are no new members. 11. The most convenient cash book used by a petty trader operating in an area where there is no banking facility is __. 12. A general journal contains __. Use the information below to answer question 13 and 14. 13. What is the cash balance? 15. The value of capital invested by the owners is __. Use the information below to answer questions 17 and 18. 17. The trial balance total is __. 18. Compute the amount withdrawn. 19. Zakari started a business in January 2000. He bought a shop costing ₦54,000 and stock worth ₦7,600. Profit for the year amounted to ₦22,100. His closing capital was 73,800. 20. The balance on the provision for depreciation account is __. 21. What are the appropriate recording procedures for entries in the trial balance? 22. Mr. Bassev purchased a motor vehicle for use in his business and debited the purchases account with the same value. This is an error of __. 23. Accrual accounting differs from cash accounting because it recognizes __. 24. A private company is different from a public company because __. D. its shares are owned by one person. 25. The receipts and payments of account of a not-for-profit-making organization plays a similar role in profit-making organization as __. 26. Osei, and Yabo were in partnership sharing profits and losses in the ratio of 3:2. On admitting Takwa, the profit and loss sharing ratio was changed to 1:1:1, supposed Takwa paid -₦30 000 for goodwill, this amount would be. D. shared to all the partners’ capital account. 27. Commission-on-turnover is charged on __. 28. The medium that enables the ATM to read the account details and process transactions directly with the account held in the bank is the __. Use the information below to answer question 29 and 30. 29. If the gross profit margin is 10%, what is the value of the cost of goods sold? 30. If the opening stock is 5% of sales. calculate the purchases. 31. A major cause of discrepancy between bank statement and the cash book that overstates the bank statement balance is the __. 32. The bank charges levied on a current account holder is the charges on __. Calculate the total of the trial balance. 34. The major feature of a journal is that it has __. D. six columns, date, particulars, folio, debit and credit. Use the information below to answer question 35 and 36. 35. Find the gross profit. 36. Calculate the net profit. 37. 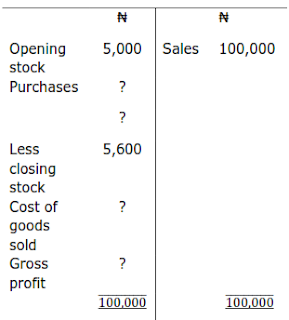 Which of the following items is a capital expenditure? A. Maintenance of office machine. C. Purchase of office stationery. 38. The corresponding entry of personal accounts found in the debit side of the cash book is to __. 39. The formula for calculating depreciation using straight line method is __. 40. The major focus of the trading account is to show __.